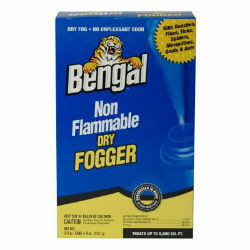 A non-flammable dry fogger allows you to conveniently leave your heat sources on. The indoor fogger is safe for kids, pets, and has no unpleasant odor. The dry penetrating fog of this insect killer is clean, non-staining, and leaves no residue behind. This indoor pesticide fogger is effective, safe, and easy to use against roaches, houseflies, ants, ticks, fleas, crickets, and spiders. Dry formula for deep penetration.